Speak with Tonja Bell at 970.346.3932. Need a product that is a liquid deicer and an onboard pre-wetting agent? Improves the ability to combat snow and ice buildup while sticking to the road. Unlike many non-chloride products, Apogee™ is not acetate based, making it the right product for areas where acetates are prohibited. 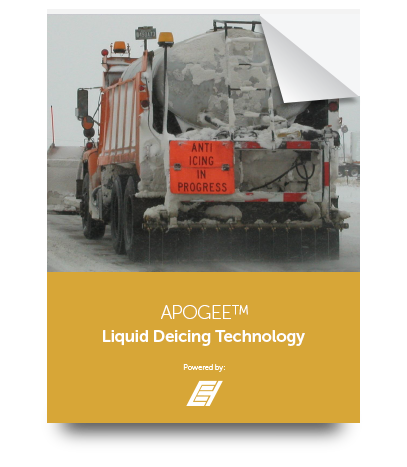 Apogee’s™ viscosity allows it to flow at low temperatures, maintain spray patterns and stay on the road longer. The product will not dry out after a storm and “dust off.” It actually helps reduce dust from abrasives and other roadway contaminants. Learn more about its performance, application requirements, areas of usage and the benefits. When used as an anti-icer for roads or bridge decks, the melting capacity of Apogee™ provides longer cycle times between applications. When used as a liquid deicer, it provides excellent melting performance and can quickly penetrate through the snow pack and break its bond at the road surface. When used as an onboard pre-wetting agent for sand and other abrasives reduces bounce and scatter as well as increases the effectiveness of the abrasive properties.